Following David Cameron's speech to the Conservative party conference, the Labour party has accused the Prime Minister of making a "misleading reference to the Government's record on the national debt", and has asked the statistics watchdog to intervene. The national debt is rising because every year the government spends more than it brings in - that difference is known as the deficit. 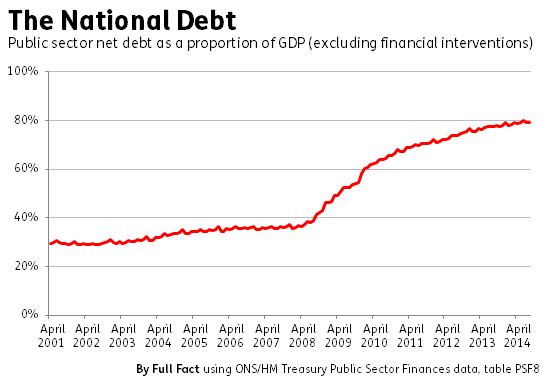 The deficit has been getting smaller in recent years, but even a small deficit continues to add to the debt. "... not just a country that is paying down its debts". That isn't accurate, as people who saw his whole speech might have realised. Earlier on, the Prime Minister had said a Conservative government would "keep on cutting the deficit" and would "balance the books by 2018, and start putting aside money for the future". The Statistics Authority responded to the Labour party today confirming that the public debt has been rising. Net borrowing is expected to move back into the black by 2017/2018, according to forecasts by the Office for Budget Responsibility. It's not the first time Labour has written to the Statistics Authority about claims by the Conservatives on reducing public debt, with the watchdog saying to Labour in February this year - and reiterating in today's letter - that all parties should be clear about the differences between debt and borrowing.